So today is my birthday (just barely still). And I have lots of thoughts about it, most of which likely will not mean anything to anyone but me, but being that it’s my birthday, I’m indulging myself. I’m now in the second half of life, I guess you might say. My best friend told me she doesn’t like birthdays anymore because they mean she is that much closer to death. Truth. Yet I find myself strangely freed by birthdays, by growing older. When I was younger, life seemed to be about letting go, getting rid of things about myself, sloughing off what is unwanted or undesireable, always becoming. Now, nothing is lost; everything is taken in and is part of the whole of who I am. This is seen no more clearly than in how God works in my life, in the lives of others, in the world. God takes the ordinary and transforms it. One of my favorite hymns points this out: Lord, You make the common holy: “This My body, this My blood.” Let us all, for earth’s true glory, daily lift life heavenward, asking that the world around us share your children’s liberty. With the Spirit’s gifts empower us for the work of ministry.” We do this every week, recognize the way God is at work in common things when we gather for Eucharist each Sunday. So nothing in my life is discarded any more — it’s all grist for the mill, teaching me, informing me, calling me to repentence or joy or sorrow or reflection. I’m still always becoming; it’s just that the process of becoming happens as God is revealed in the common, ordinary rhythm of my days. Today I realize that it’s time to tell the truth to myself about my life. That I drive fast — too fast. (I’m always safe, but it’s not a good thing when your teenage boys think you drive too fast.) That I’m finally so at home in my life, finally living into a call God placed on me so long ago, and it is right and good and joyful. That saying yes to God messes up the other things in life — change always brings that, always disrupts. That I will likely never be someone who fits very neatly into the box of life. That I love in all the most unexpected places and all the wrong people. That I always see life as poetry, always find something more. That I’m easily hurt but I always hide it. That snow falling in the mountains makes me cry because of the beauty of it. That I hate being vulnerable but I want to be known. That I’m not very good at accepting good things, or praise, or birthday presents and wishes because I know the deep truth of my own frail and tenuous nature. Like Pope Francis’ answer to who he is, I am a sinner, and God continues to love me anyway. That the shattering truth of God’s love is the heart of life’s meaning. That I love plaid and red and thatched roofed cottages and the sound of the ocean as it moves, and moves, and moves my soul. That I want to dance and sing and shout for joy at the top of my lungs when I see the faces of the people I love, I want to embrace them and tell them how much I care — but I often stop myself. That I’m a mess. That I take on too much and do it with such enthusiasm. That I’m scared of the dark because bad things happened to me in the dark all those years ago, and no matter how much time passes, it still lurks in my psyche. That I have too many pairs of shoes. That I wish I had more time to be with people, even irritating people or people who use me or people who are overly needy or people who no one else seems to like. That it pisses me off to see us Christians pay lip service to justice in the world, crying out to God for justice but failing to do justice ourselves. That I need a community around me to help me remember who I am. I’m glad to be turning another year older. What an amazing thing, to wake up every day, to wrestle with God in the dark hours of the night. Recently I went to the local art museum. (What a great place!) I wandered among the galleries, glimpsing the past, the really distant past, things from so long ago, wondering what woman laid her head on the stone pillow stand, or what child held a jug, or what man painted the beautiful, foreign symbols on the wooden panels after someone’s death. By the time I made it to the Greek marbles, those amazing moments in time captured in cool white stone, the empty eyes looking out, the missing pieces which have been chiseled back in — when I got there, I found myself sinking down on the bench and weeping. What is this life, this precious moment we try so hard to grasp or understand or just be a part of? What part of my little corner of the world will go on? What living, breathing, loving, laughing, restless, tender, poetic souls held these things? Made them? Lived them? What am I, in this constant flow of time and space? See what birthdays do? Birthdays take us back to the basics, to lazy days of learning about life and love and mystery on mystery. 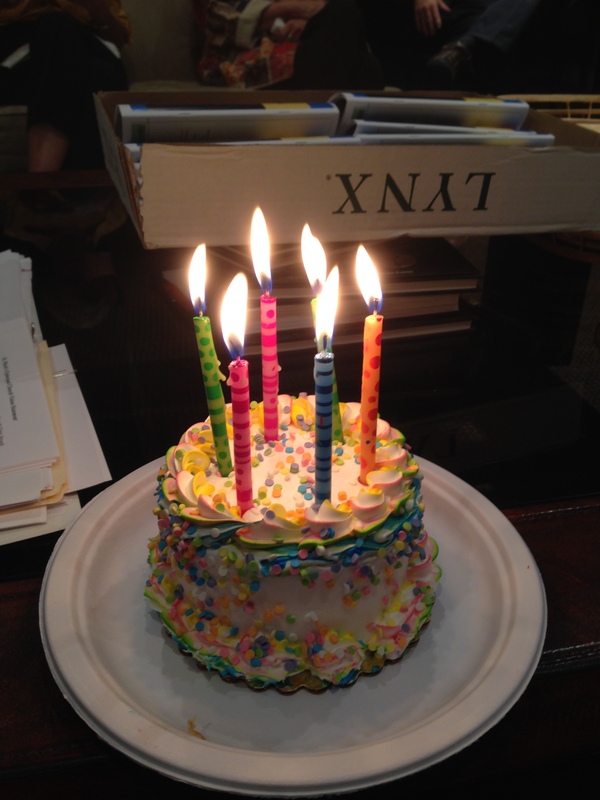 Birthdays move us forward, make us just for a moment (if we let them) glimpse what waits for us around the corner. My favorite songs always float through my head — lines of poetry I carry with me, the soundtrack of my inner world. And today, well, there have been lots of songs today floating around. But the one that keeps showing up is about forgiveness and learning life’s lessons. So for the next year, I’m learning again the things I thought I knew — forgiveness, love, joy, grace. I’m once again opening myself up to fail, falling into the loving arms of God, who promises to love me, to protect me, to cajole me and push me and keep waking me up to this moment, this life I’ve been given. I’m risking all in giving myself to others, by loving them, by opening my heart and my life to the people I know and have known and will come to know. And I’m truly thankful for another day, another year, even just this moment. Amen. Just scroll to the bottom of the page and hit follow. Kathleen Scanlan Sco… on Where is God?